Thanks to all of you who visited and especially to those of you who found the time to join our challenge. This week our winner is Mary with this gorgeous entry. Please join us in congratulating Mary by visiting her blog to see more of her lovely work. 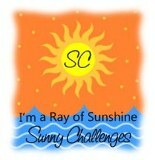 We would be very pleased if Mary would display our badge on her blog. Don't forget to check back tomorrow and see what new challenge we have for you. Thanks for giving me the Ray of Sunshine this week. I will add the award to my blog. Thanks also for keeping the challenges coming.